The core of true martial arts is the rising and advancing of the spirit. Sadly, in modern times the true "heart" of budo has taken a back seat to ego, the lust for fame and fortune, and public gullibility. Famed martial arts advocate Richard Kim puts everything back into perspective in what just may be the most comprehensive article on the subject ever to appear in print. Tradition has it that the martial arts go back 4,000 years into Chinese history. Traditional martial arts encompass all forms of external and internal, hard and soft, weapon and weaponless systems of fighting. Legend has it that the origins of the martial arts can be traced back to the legendary yellow emperor, Huang Ti, who wrote his classic treatise on internal medicine, the Nei Ching. He also developed military practices involving the use of weapons and weaponless fighting. With the advent of Confucianism and Taoism, the martial arts developed from a physical to a spiritual path of existence, and a philosophical code underlying the arts took form. The core from which the modern martial arts developed emerged with Dharma (Bodhidharma) when he went to China from India. He introduced Zen Buddhism with the philosophical principle of the "empty mind" and satori. At this point, the martial arts moved into the realm of religion as only monks practiced them. The arts reached their most perfected form of expression within Budism. It was within Buddhist eras that the most important forms of training were either innovated or notated for posterity. 1. Dragon Fist. Emphasized the training and development of the spirit. Lightness, stillness, and change were instilled. 2. Tiger Fist. Strengthening the bones, emphasizing jumping up and down with firmness of the shoulder and waist. 3. Leopard Fist. To develop strength and application of force, jumping and fighting. 4. Snake Fist. Practice of inner breathing to become sensitive and active with a pliable body. 5. Crane Fist. To train in concentration, stability, accuracy, and determination to defeat an enemy. The five fists emphasized breathing correctly. These five fists combined the hard and soft elements that existed in various systems of movement and became the basis of the different styles throughout China and the Orient. From this traditional background, imbedded with the teachings of Confucianism, Taoism, and Zen Buddhism, the mastery of the martial arts is not only a physical endeavor, but also a philosophical accomplishment. 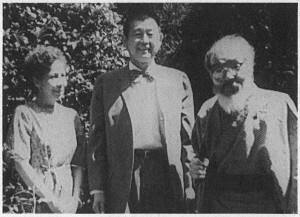 Once, when a prominent sensei was lecturing, he said, "We cannot talk about karate as a martial art without understanding the history of karate in Japan and the impact of the man known as the father of karate, Master Gichin Funakohi." We can safely say that modern karate dates from 1922, the year Gichin Funakoshi first demonstrated Okinawan tode at a physical education exhibition sponsored by the Japanese Ministry of Education. The tode that Funakoshi demonstrated had origins that went back into Chinese history, although it developed and matured in Okinawa. "To" means China and "de" is translated as meaning technique, therefore, tode means, "China hand technique." In Japanese, the "to" can also be pronounced as "kara," as "de" can be pronounced "te"; therefore, kara-te. The Japanese used a different character to write "kara," so it no longer means "China." The modern definition means "empty," or "nothing." Some have been confused and defined karate as "empty hand," or "without weapons." In reality, the emptiness is an emptiness of self, a freedom from the psychological obstructions of fear and self-consciousness which hinder the free-and-total use of physical techniques. This definition of "emptiness," coming from Zen, is the basic philosophy of the Japanese martial arts. Long before the arrival of Funakoshi, the martial arts of Japan were known as budo. Budo existed as a unified philosophy; kendo, judo, kyudo, etc., are only different in the method of techniques they employ. 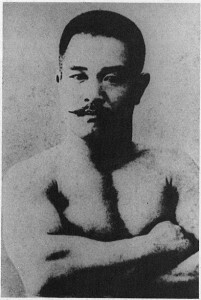 Gichin Funakoshi, before he was chosen to go to Japan, had become the president of the Okinawan Martial Arts Society. Before he went, he consulted the great tode masters in Okinawa and selected from them what he considered to be the best and most representative examples of Okinawan tode. This was in the form of 15 kata; 10 of the 15 being traditional forms, the other five the pinan kata devised by ltosu Yasutsune in the period from 1905-10. The exhibition lasted only a week, but it left an impact on the martial arts world of the Japanese and began the emergence of an art that was to overshadow the other budo/arts, especially in the Western world. The old techniques long held so mysterious were examined thoroughly and logically in the light of modern science, and gradually grew into karate as we know it today. Today when one enters the martial arts, one strives to become a "black belt." In a legitimate school, as the training of a student progresses he will become aware of the molding of himself into a better person, that the perfection of character is the goal set by the sensei. Traditionally this has been the goal. The black belt is an award or honor given to a student who has sacrificed years in disciplining and honing his body and mind to achieve quintessence of physical, mental, and spiritual attainment. Originally, the ranking system was established to provide a series of levels or steps by which the student could measure his progress. The first black belt awarded is a shodan. Further progress will result in dan ranks or degrees being conferred. This ranking system, after World War II, worked very well in motivating the student, but it also has resulted in some problems. The disparity of standards has developed a problem that can be summed up as, The higher the number of grades the lesser the truth. Also, the awarding of 1Oth dans given by self-created organizations to the "new" masters of the martial arts has become commonplace. A proper ranking system should remain universally constant; just as a man six feet tall is always equal in height to another six feet tall, if the measurement is done by the same standard. Judo and kendo, for example, have one international standard of testing which prevails through­out the world. This is due, in part, to both of them having their origins in Japan where the value, the rules of "rank" grew with the respective art. It is also due to the Dai Nippon Butoku-Kai which, as a section of the Ministry of Education, since 1895, established standards and awarded all ranks, up to the end of World War II when it was disbanded by the occupation forces under General MacArthur. In 1954, the Butoku-Kai was reactivated under the auspices of a Diet member named Ma­ chino and the legendary Ohno Kumao. The Butoku-Kai is a martial arts organization which traces its origins to the Emperor Kanmu, the 50th emperor of Japan, 781-806 A.D. He opened in the imperial grounds the Butoku-Den (Buto­ ku-Hall) in March, 797, (Enryaku jugo­ nen). In Emperor Kanmu's time on May 5, the Butoku-Den tied in with the beginning of the Heian Shrine. This was the beginning of true samurai spirit and training. When the Dai Nippon Butoku-Kai opened as a section of the Ministry of Education in 1895, the prime movers were Prince Fushimi and Baron Oura. Established in conjunction with the Heian Shrine, Emperor Kanmu was revered as a deity in the shrine. 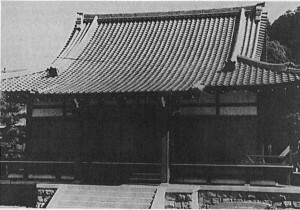 The modern Butoku­ Den was opened in Kyoto, Japan in 1899. Only kendo and judo was practiced at first. Therefore, both of these arts developed one international standard for ranks which prevails until today. The kendo section was headed by Naito Takahara, a swordsman of the Hokushi Itto Ryu, and the judo section was headed by one of Kano sensei's top students of the Kodokan, lsogai Hajime. When the Dai Nippon Butoku-Kai was established in 1895, the Sosai, or president, was a member of the royal family, Komatsu-no­Miya, Akihito Shinno Denka; the Kaicho, or chairman, was Watanabe, the Governor of Kyoto; the Fuku-Kaicho, or vice­chairman, was Minobu, the Bishop of the Heian Shrine, and the other vice-chairman, was Toriumi, the head of the Kyoto Chamber of Commerce. The first Butoku-Matsuri (martial arts festival) was held on October 25, 1896, in a makeshift tent and temporary hall. Kata and shiai were held in kendo and judo. 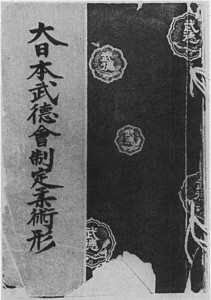 1st, 1906, the title of Kyoshi was conferred. The practice is continued up to the present time. A training apprentice title Renshi was also designated later. 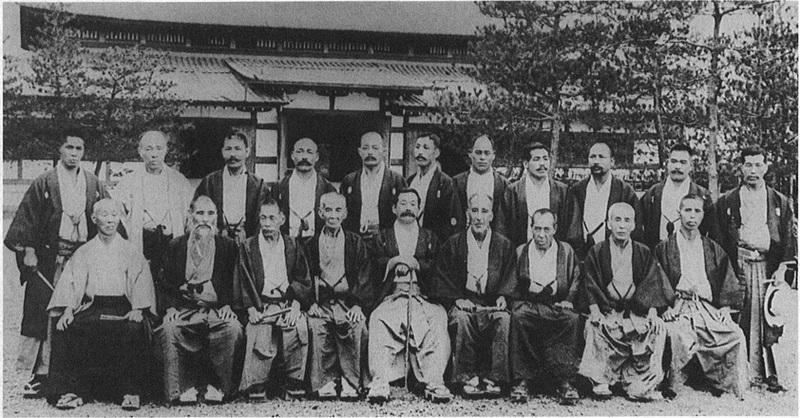 In 1911, the Dai Nippon Butoku-Kai opened a martial arts specialty school, the Bujutsu Semmon Gakko. Later on, it was changed to the Budo Semmon Gakko, popularly known as the Busen. Its aim and purpose was to promote and cultivate Budo in a true samurai spirit; to produce teachers to go out and propagate the real Japanese Martial Arts. The dan system was introduced by Kano Sensei, the founder of the Kodokan, and basically involved six steps known as kyu, three white belt steps and three brown belt steps, followed by the dans or grades, of which the shodan was the first grade. This was the first black belt degree or step. There were and are until today ten steps in the black belt ranks. Karate, from 1922, when it was introduced into Japan proper, up to the end of the Pacific war followed the judo ranking ystem. However, after 1950, many different schools sprung up, each having its own set of standards when it came to testing and conferring of dans. The Japanese martial arts were forbidden by the occupation, with the exception of judo, which was considered a sport. The central authority of the Butoku-Kai was gone, hence the proliferation of many schools with many "new" masters. 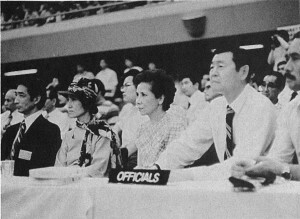 Thus, when karate was propagated internationally, the various countries embraced each style and each set of standards. A situation arose outside of Japan in which individuals set up their own organizations and handed out black belts without standards, but only for the money they could make. The end result today is there are as many black belts as there are students, who, frankly, are a disgrace to not only themselves but to the art of karate. Since the Western public is not well aware of the differences in ranking and the ability of a real black belt, they are the losers. They may attend classes where the lure is an easy black belt which is not only dangerous to the student, but also denigrates the art of karate. 1) To standardize dan and kyu ranking systems which until then, worldwide, were left up the judgment of each organization. 2) To establish standardized uniform tournament rules. 1) Regular rank: The stage of progress of the human character as reached through physical and spiritual practice of karate. 2) Recommended rank: The stage of progress of the human character as reached through both an individual's continued practice as well as one's total contribution and service to the development of karate. 3) Honorary rank: An award of rank as a result either directly or indirectly of one's service and support of the development of karate. (1st Kyu) At this point, the individual must be capable of executing all fundamental body movements and techniques with proper application. This includes all hand and leg techniques. (1st Dan) This level necessitates a further maturation of abilities. All basic body movements and techniques, including hand and leg techniques, can be applied with extended force and proper application in basic combinations. Kihon - performs single techniques and basic combinations. (2nd Dan) This state requires the personal assimilation and performance of all basi body movements and techniques to such a degree that their application is in accord with the individual's own unique body demands. Kihon - combination of all basic techniques. Kihon - free sparring or self-defense from multiple positions, with or without weapons. (3rd Dan) At this position, the individual has acquired the understanding of the underlying principles in all basic body body movements and techniques. Moreover, this understanding can be demonstrated in teh application of techniques under varied curcumstances and conditions. Kumite or Self-defense - Free sparring of self-defense with multiple attachs from multiple positions with or without weapons. (4th Dan) The individual attaining this standing as exemplified knowledge of the principle boy movements and techniques and their application under varied conditions to such a degree that teh aility to instruct others has been gained. Instruction - must provide instruction with self-demonstration. (5th Dan) This is the level wherein research has been completed in some limited area. This research includes its application in a manner that is both relevant and appliciable to the individual's particular physique. Kata - Advanced Kata with all required factors combining physical and spiritual. Research - Presentation of favorite technique along withe explanations and self-demonstration. (6th Dan) The attainent of this position necessitates the performance of karate research in an area that by its nature has a universal benefit to be derived by its application. 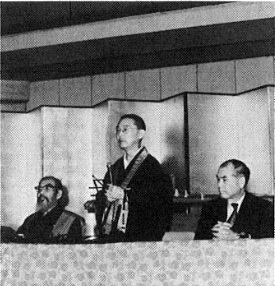 Presentation of written report of karate research. (7th Dan) To achieve this level, the individual must have undertaken advanced research through actual application and extensinve testing of the general research technique. Examination Standard: Presentation of written report on karate research and the appliation and experience of such research. (8th Dan) At this point, research must have been completed in a new and previously unknown area. Examination Standard: Presentation of written research report on a new and yet untouched area. (9th Dan) The requirements for this standard call for an uncomon dedication for an extended period of time to the areas of individual achievement, research, and technique. This dedication must have culminated in karate achievement and development of the highest and most extraordinary order. Moreover, thi accumulated knowledge and expertise must have been utilized in the general service of Karate development. Examnation standard: Review by central ranking committee. (10th Dan) This is the stage where the individual has finally neared teh highest image of karate development. This has been brough about by the continuous practice and pursuit of the truth that is to be found in the human ideal. Examination standard: Review by central randing committee. 1) Basic Techniques: Includes all stances, punching, striking, blocking, kicking. 2) Each level of ranking requires that the individual has accomplished preceding ranking requirements. 1) Has applied oneself by hard work, through continuous practice to achieve a high spiritual developent. However, there is a physical limitation or handicap. 2) Has provided distinguished service through instruction and continued practice but is limited or lacking in technique for respective rank. 3) Has fulfilled necessary regular ranking requiremnt but through circumstances has been unable to be evaluated under required ranking procedures. 4) Any other circumstance other than described above and has contributed to the advancement of karate, such as research and development, etc. 1st Dan - Has provided indirect support of karate at the local community level within a country or territory. 2nd Dan - Has provided direct support of karate at the local community level withing a country or territory. 3rd Dan - Has provided indirect support of karate at teh national level. 4th Dan - Has provided direct support of karate at national level, or may be a local dignitary or leader who has provided indirect support. 5th Dan - Has provided indirect support of karate as a national dignitary or leader in such areas as social, educational and financial, or may be a local dignitary or who has provided direct support. 6th Dan - Direct support of karate by a national leader. 7th Dan - indirect support of karate by a national soverign or top leader or highest official. 8th Dan - Direct support of karate by a national soverigh, top leader or highest official. 9th Dan - Indirect support of karate by an international leader or internationally repected figure. 10th Dan - Direct suppor of karate by an international leader or internationally respected figure.